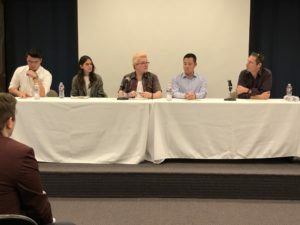 The Institute of Buddhist Studies hosted its fifth annual Graduate Student Symposium on October 5, 2018, at the Jodo Shinshu Center in Berkeley. Five graduate students presented papers dealing with the theme, Buddhist Political Engagements. Dr. Scott Mitchell, Dean of Student and Faculty Affairs gave welcoming remarks to start off the symposium. Thomas Calobrisi, a doctoral student at the Graduate Theological, presided. Brent Beavers, on the Buddhist chaplaincy track of the GTU MA program, presented a paper titled “The Gender Transformation of Avalokitesvara.” Beavers showed the development of Avalokitsvara’s transformation from male to female as it moved from India to China and argued that the transformation occurred as a manifestation of compassion with the engagement with laywomen of China. Brinna K. Morseth of Dharma Realm Buddhist University presented on “Taixu and Buddhism in Taiwan: Coming Down From the Mountain and Out From the Cave.” She reported on the activity of reclusive monks in the mountains and caves to engage with people in society. Adrien Chorn, University of California, Berkeley, presented on “Buddhist-Rightful Resistance: Monastic Activism in Contemporary Cambodia.” He introduced the work of Ven. Loun Sovath of Cambodia, who is engaged in the activity of compassion in politics to ease the suffering of the people. C.J. Dunford, on the joint ministry/chaplaincy track at the Institute of Buddhist Studies, presented on “Minority Stres- and Trauma-Informed Shin Buddhist Pastoral Care for LGBTQ Communities.” He described the importance of an introspective self-transformation to inform us in the work of engagement. The keynote address, “Impure Land: Ethical Living for Evil People,” was delivered by Dr. Melissa Anne-Marie Curley, assistant professor in the department of Comparative Studies at Ohio State University. Her first book, Pure Land, Real World: Modern Buddhism, Japanese Leftists, and the Utopian Imagination, examines modernist reinterpretations of images of utopia and exile in the context of the Asia-Pacific War. Her keynote address, which built on this book, explored the interrelated issues of ethical living, modern Japanese Buddhist thought, and arguments for or against engaged Buddhism. A lively and engaging discussion between Dr. Curley and the graduate presenters follower her address. This event was made possible, in part, by the Numata Foundation and its generous support of the Institute of Buddhist Studies. 10/11/2018: This might not be appropriate for this forum but is important to consider overall. There have been a few high profile instances of abuse by Buddhist Teachers in certain Traditions. Simply put, there are some Buddhist Traditions where the Teacher is never questioned and their actions are always seen as expression of the Highest Wisdom. This has caused significant harm and pain not only to those in that particular Dharma but within their family and friends. The Path of Nembutsu in contrast is an independent approach and also one that an individual can fully engage on their own. There are abundant historical examples to support this. This topic would make an excellent subject from a Buddhist Theoretical and practical perspective. Nembutsu appears to not fall into the trap of Dharma where a incapable or corrupt Teacher can harm Sangha members.